In May 2017, The Human Animal Bond Research Institute (HABRI) and Green Chimneys announced the publication of a study exploring the effectiveness of an animal-assisted social skills intervention for children with Autism Spectrum Disorder (ASD). Research was conducted at Green Chimneys, a therapeutic school and treatment center for children facing social, emotional, and behavioral challenges. Findings demonstrate that incorporating therapy dogs in social skills training is a valid approach to teaching children with ASD to engage with peers and improve social interaction. Dr. Becker, along with co-PIs Dr. Erica Rogers and Dr. Bethany Burrows, analyzed 31 Green Chimneys students ages 8-14 diagnosed with ASD and compared social and emotional functioning before and after the intervention. Students either participated in an animal-assisted social skills group or in a traditional social skills training group without an animal present. Findings showed that the inclusion of dogs in social skills training was more effective than traditional programs. Specifically, participants who received the animal-assisted social skills intervention exhibited fewer social skills deficits overall, fewer restricted and repetitive behaviors, and more typical social communication following the intervention. The study also found that participants who received the animal-assisted social skills intervention exhibited a greater level of change in social skills, perspective taking, theory of mind, and decreased feelings of isolation and depression. Dandelion came to Green Chimneys after being abandoned by her former owner at a veterinary clinic in Pennsylvania. Initially, we were told that Dandelion was a boy, but we soon discovered that she is female! While her story has a happy ending, it serves as a reminder that caring for any animal is a lifelong commitment. 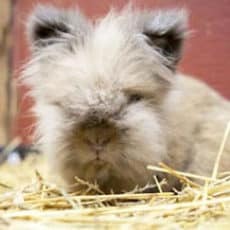 The Lionhead Rabbit is a relatively new breed that first appeared in Belgium.